Manchester United eased into the EFL Cup semi-finals as they beat West Ham with manager Jose Mourinho absent from the Old Trafford dugout. The Portuguese, given a one-match touchline ban before the game, stayed out of view as United set up a last-four tie against Hull City. Zlatan Ibrahimovic clipped in the opening goal inside two minutes before former United youngster Ashley Fletcher equalised as he pounced on David de Gea's error. 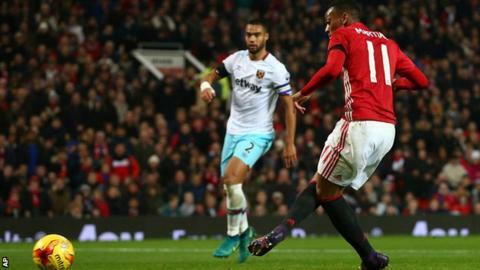 Anthony Martial re-established the home side's lead shortly after half-time, drilling Henrikh Mkhitaryan's cross past Hammers keeper Adrian. The France international extended United's lead when he stroked in Antonio Valencia's low cross after a well-worked team move, with Ibrahimovic adding the gloss by tapping in with virtually the last kick of the game. Mourinho will have been pleased with his side's fluent attacking display, and even happy enough to bring on substitute Bastian Schweinsteiger for his first game since March. Mourinho claimed his first honour in English football when he led Chelsea to the 2005 League Cup, following that up by lifting the iconic three-handled trophy again in 2007 and 2015. And naming a strong line-up against the Hammers indicated he is keen to become only the third manager to win the competition on four occasions. It is not certain, though, where Mourinho, 53, watched his side on Wednesday night. "It is a secret," he said afterwards. He was seen arriving at Old Trafford, then spotted waiting to shake Hammers boss Slaven Bilic's hand before kick-off. Then he disappeared into the bowels of the Sir Bobby Charlton Stand. In his absence, the home side played with a vigour and verve long missing from Old Trafford performances in recent years. The attacking quartet of Ibrahimovic, Martial, Wayne Rooney and Mkhitaryan were a handful throughout and, although the Hammers goal was preventable, Mourinho was more than content. "Goals plus performance means the real happiness," he said. While Ibrahimovic and Martial put their names on the Red Devils scoresheet, it was Rooney and - particularly - Mkhitaryan pulling all the strings. The Red Devils skipper was restored to the starting XI as he threatens to break Sir Bobby Charlton's 43-year standing as the club's all-time leading scorer. Rooney, who needs one goal to draw level with Charlton's tally of 249 strikes, might not have scored against the Hammers, but impressed with his all-round display. He picked up an avoidable booking for arguing with referee Mike Jones, therefore ruling him out of Sunday's trip to Everton - and potentially breaking Charlton's record at his boyhood club. "Some of his passing and awareness tonight has been nothing short of magnificent," said former Scotland striker Ally McCoist, who was BBC Radio 5 live's expert analyst at Old Trafford. It was during Sunday's Premier League draw between the two sides in which Mourinho was sent to the stands by referee Jon Moss after kicking a water bottle in frustration. The Hammers failed to replicate that disciplined performance at the weekend as they unravelled in the second half on Wednesday. Bilic will have been pleased with battling qualities shown by his side in the first half, riding out an early storm to level with their first shot. The Croatian manager will not have been pleased to see them carved open so easily after the break, however. Nor will he have been happy to see left-back Ryan Cresswell substituted to add to his injury woes. Back to the Premier League. Sixth-placed United go to Everton, who are a place and a point behind them, on Sunday (16:00 GMT). The Hammers are a point above the relegation zone in 16th place and host Arsenal at the London Stadium on Saturday (17:30). Match ends, Manchester United 4, West Ham United 1. Second Half ends, Manchester United 4, West Ham United 1. Goal! Manchester United 4, West Ham United 1. Zlatan Ibrahimovic (Manchester United) right footed shot from the centre of the box to the centre of the goal. Assisted by Ander Herrera. Attempt missed. Sofiane Feghouli (West Ham United) right footed shot from the right side of the box is just a bit too high. Assisted by Cheikhou Kouyaté. Offside, Manchester United. Ander Herrera tries a through ball, but Marcus Rashford is caught offside. Attempt missed. Sofiane Feghouli (West Ham United) right footed shot from the right side of the box is close, but misses to the right. Assisted by Edimilson Fernandes. Substitution, Manchester United. Marcus Rashford replaces Henrikh Mkhitaryan. Attempt missed. Bastian Schweinsteiger (Manchester United) right footed shot from outside the box is close, but misses to the right. Assisted by Zlatan Ibrahimovic. Attempt blocked. Edimilson Fernandes (West Ham United) right footed shot from the right side of the box is blocked. Substitution, Manchester United. Bastian Schweinsteiger replaces Anthony Martial. Attempt missed. Simone Zaza (West Ham United) left footed shot from the right side of the box misses to the left. Assisted by Manuel Lanzini. Corner, Manchester United. Conceded by Adrián. Attempt saved. Zlatan Ibrahimovic (Manchester United) right footed shot from the left side of the box is saved in the bottom right corner. Assisted by Henrikh Mkhitaryan with a cross. Attempt blocked. Henrikh Mkhitaryan (Manchester United) right footed shot from outside the box is blocked. Assisted by Zlatan Ibrahimovic. Attempt missed. Wayne Rooney (Manchester United) right footed shot from the left side of the box misses to the right. Assisted by Henrikh Mkhitaryan. Offside, Manchester United. Anthony Martial tries a through ball, but Wayne Rooney is caught offside. Substitution, West Ham United. Simone Zaza replaces Dimitri Payet. Corner, West Ham United. Conceded by Daley Blind. Corner, West Ham United. Conceded by Henrikh Mkhitaryan. Goal! Manchester United 3, West Ham United 1. Anthony Martial (Manchester United) right footed shot from the centre of the box to the bottom left corner. Assisted by Antonio Valencia. Wayne Rooney (Manchester United) wins a free kick in the attacking half. Substitution, West Ham United. Manuel Lanzini replaces Michail Antonio because of an injury.